Students, please make sure that you go to the website that ends with .ed.gov. There are many "fake" FAFSA websites that exist to steal your personal information. You will NEVER need to pay to complete the FAFSA! You can use the IRS Data Retrieval Tool to automatically pull you tax info from the IRS info the FAFSA form. Click here for details. 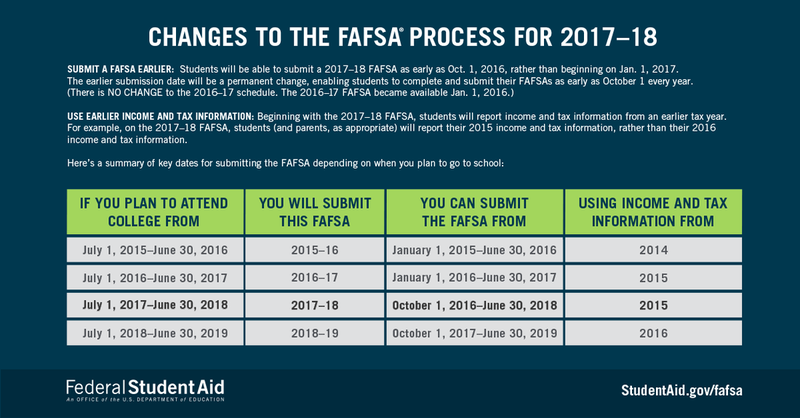 Beginning with the class of 2017 and beyond, families will use their previous taxes due to the FAFSA being available beginning in October. Please see the chart below. This is a free online tool designed for families that are not yet able to complete the FAFSA but wish to estimate how much financial aid their student(s) may receive, create scenarios based on future earnings, and then establish college funding strategies if interested. Click here for more information about this tool. Who should I report as my parent(s)? The U.S Department of Education has an online guide to help you complete the FAFSA. Click here for more info! Note: On May 10, 2015, the Federal Student Aid "PIN" was replaced by the "FSA ID." You will now need an FSA ID, not a Federal Student Aid PIN, in order to complete the FAFSA. Click here for information about obtaining your FSA ID. Our Career Coach is also a fantastic resource that can assist students and families with completing the FAFSA!